Converse's Weapon EVO is live and ready for you...what are you waiting for? Go ahead choose your Weapon and get out there and play basketball like your life depended on it. 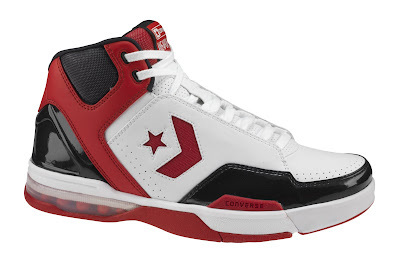 Below is the press release from Converse and a picture of the White/Black/Red colorway of the Weapon. However, for more pictures and even videos you need to take your internet loving self over here. when players changed basketball by bringing their unique style to the sport. change and challenge the status quo." blockings, give the shoe a retro look for off-court appeal. overlay to help contain splay during hard cuts. champion. Content from the event is posted online in webisodes on Converse.com. I'm going to be in Pigeon Forge, TN the rest of week....by the way that would be a great place for Converse Store....so there may or may not be a Friday Flashback this week. You'll just have to come back and check it out for yourself. I have two pairs of these now. The Celtics Energy colorway, and the regular Celtics team colorway. Great shoe! I'm heading out to FL in March, hoping to pick up a couple pairs for myself and my son too.